Joseph's story gives us all hope that God is at work while we're waiting. What are you waiting on? More importantly, how are you waiting? I love this song by John Waller, "While I'm Waiting"! This is how I want to wait. It's how Joseph waited. He served, he was peaceful, he was faithful, he was obedient, and he worshiped. In this video, John gives his beautiful testimony behind why he wrote "While I'm Waiting". Whatever you find yourself waiting on from God, I pray that this song will become your prayer while you're waiting. Here's our reading plan for this week and my S.O.A.P. for today's chapter. Scripture: Genesis 41:1, 9, 14-16, 46 Then it came to pass, at the end of two full years, that Pharaoh had a dream; and behold, he stood by the river. 9 Then the chief butler spoke to Pharaoh, saying: “I remember my faults this day. 14 Then Pharaoh sent and called Joseph, and they brought him quickly out of the dungeon; and he shaved, changed his clothing, and came to Pharaoh. 15 And Pharaoh said to Joseph, “I have had a dream, and there is no one who can interpret it. But I have heard it said of you that you can understand a dream, to interpret it.” 16 So Joseph answered Pharaoh, saying, “It is not in me; God will give Pharaoh an answer of peace.” 46 Joseph was thirty years old when he stood before Pharaoh king of Egypt. And Joseph went out from the presence of Pharaoh, and went throughout all the land of Egypt. Observations: It had been 2 full years since the prison release of the chief butler that Joseph had been waiting to be remembered for his own release from prison. Now two years later, the day finally comes when the chief butler remembers Joseph for the interpretation of Pharaoh’s dream. Joseph’s release from prison is described as quick, but when we look at the age of Joseph in verse 46, we see that he is 30 years old. Joseph was sold into slavery at the age of 17. He was in Potiphar’s house for 11 years, and then spent 2 years in prison. That’s a total of 13 years of waiting for the fulfillment of Joseph’s own dreams from God about the plan He had for Joseph’s life. We can see in Joseph’s response to Pharaoh’s praises of his interpretations of dreams that God has been working on Joseph’s character during this 13 years of waiting. Joseph doesn’t want the praise or credit for the interpretation of dreams, but is quick to give all the praise and credit to God as the One Who gives the interpretation. The other character developments we have seen going on in Joseph’s life is faithfulness, diligence, and godliness. Skills of administration were also taking shape in Joseph’s life during this time that would eventually help to save lives of his family through which the Savior of the world would come. Application: So many times we think that nothing is happening while we are waiting on God to fulfill His promises in our lives. 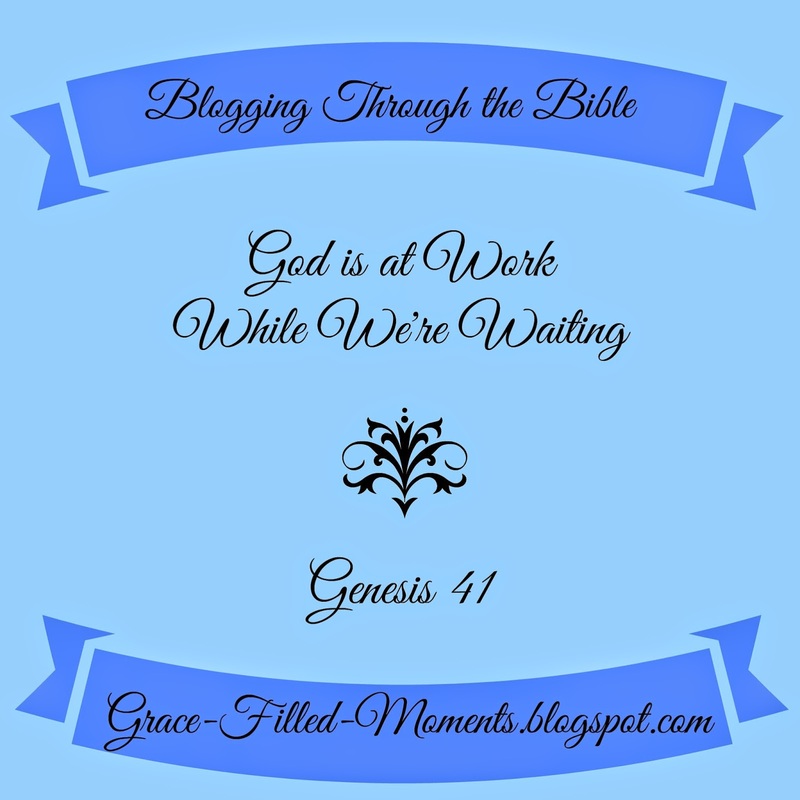 But God is at work while we are waiting – He’s working to develop our character. Prayer: Heavenly Father, help us to wait in a manner that is worthy and glorifying to the Name by which we are called. Let us firmly stand on the promises that You have given to us in Your Word. Help us to realize that You are always at work even when it seems to our natural eyes that nothing is happening or worse yet when everything that is happening seems to be going against us. It’s hard to wait when difficulties and obstacles are mounting up against us. Help us to surrender the areas of our character where You desire growth for Your glory. Help us to trust that Your timing is perfect even in the waiting. In the loving name of Jesus I pray. Amen!